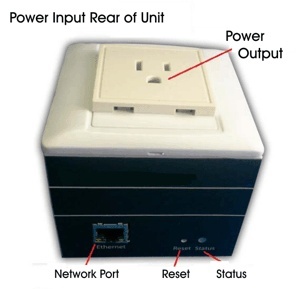 The RPS-NODE-9255 Remote Power Switch Unit. You will need to supply a standard PC power cable to power the device. A printed manual is not supplied. We maintain our manual online for this product to allow for updates and revisions as needed. Software downloads are also available 24/7 days per week from this site. A Standard PC Cable is used to power the RPS-NODE-9255 Unit. It connects to the back of the unit. The Output Power Socket is located on the top of the unit. Maximum Output is 8 Amps. The RJ45 Ethernet Network Cables goes into the port on the side of the unit. The RESET button is depressed using a paper clip and held down for approx. 9 seconds to reset the unit back to factory defaults with an IP address of 192.168.1.100. The Status Indicator Light will glow RED when the power to the Output Electrical Socket is OFF and GREEN when the power is ON. The RPS-NODE-9255 does not have an external ON/OFF switch. When power is supplied to the device, it is ready for operation. Your ROUTER will need to port forward both TCP/UDP packets to the IP address of the RPS-NODE-9255 Unit on your internal network. This will enable you to control your Remote Power Switch from anywhere on the internet using your web browser. The Product Code for the US Version of the unit is RPS-NODE-9255-US and is pictured on the left. The RPS-NODE-9255 is available in several foreign electrical sockets as noted above. Lead time for conversion and shipment with the above configurations typically is 7-10 business days.